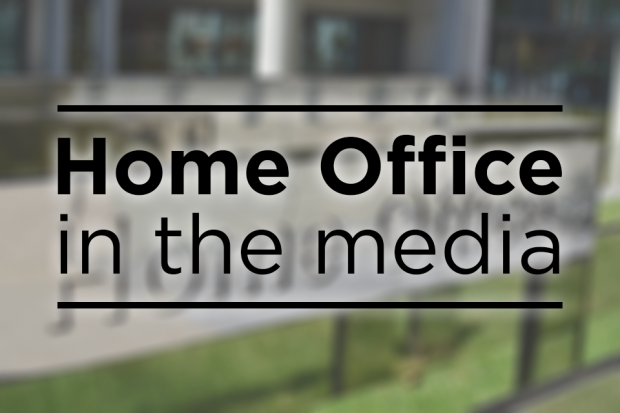 Today's Home Office stories include the major incident in Wiltshire and the sentencing of a women for Modern Slavery offences. There is widespread coverage across broadcast and in print media of the couple taken critically ill in Amesbury over the weekend. The papers report that Charles Rowley and his girlfriend Dawn Sturgess became unwell with similar symptoms to Sergei and Julia Skripal, who were poisoned with Novichok in March this year. The couple were found collapsed in their home on Saturday and were admitted to Salisbury District Hospital. The Security Minister Ben Wallace appeared on broadcast this morning and said that the risk to the public is low, but that people should follow Public Health England and police advice. Comments from Neil Basu, the senior National Coordinator for Counter-terrorism Policing, are carried in some of the papers. He said that the link with the Skripals was being investigated and scientists would assess whether it was from the same batch. The Telegraph and Times say the incident comes after efforts were made by health officials to assure residents there was no wider public health risk after the poisoning four months ago, and follows efforts to try to bring visitors back to the city. The Today programme also reports that the Home Secretary will chair a meeting of the COBRA committee to discuss the nerve agent poisoning, adding that at least five sites in Amesbury and Salisbury have been sealed off. I want to express my thanks to the emergency services and staff at the Salisbury District Hospital for their tireless professionalism in dealing with the incident in Amesbury. It follows the reckless and barbaric attack which took place in Salisbury in March. The Amesbury investigation is ongoing and the police must be given the space they need to continue establishing the full facts. My thoughts at this time are with the two individuals affected. The Government’s first priority is for the safety of the residents in the local area but as Public Health England has made clear, the risk to the general public is low. Today I will chair a meeting of the Government’s emergency committee COBR in relation to the ongoing investigation. The Daily Express, Times, Metro, Daily Star and Mail all report on the sentencing of Josephine Iyamu, who was found guilty of trafficking five women into Germany. She has been jailed for 14 years. The British national had smuggled her victims – aged between 24 and 30 – from Nigeria to Germany to work as prostitutes. The Express, Times and Mail hail it as a landmark case as Iyamu is the first person charged under the section of the Modern Slavery Act 2015 that allows British nationals to be prosecuted for human trafficking offences abroad. This is an important milestone in this country's efforts to tackle the horrors of trafficking and modern slavery. It has been made possible by our dedicated law enforcement professionals working closely with their international colleagues and it is positive to see our world-leading Modern Slavery laws helping to rid society of these evil crimes.